We all have lofty ideas when it comes to cooking a romantic dinner for the one we love each Valentine’s Day. I’ve found over the years that the biggest deterrent can be fear of failure. No one should be worried about that in the kitchen when the main ingredient is love, right? Have no fear making the following fancy recipes, they are so easy to execute, make use of expensive ingredients in creative (money-saving) ways, and will delight any palate. 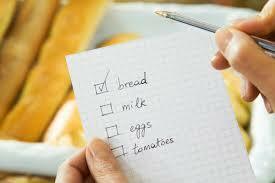 Best of all, they can be made in advance so you can focus on quality time instead of cleaning up a messy kitchen! 2 lobster tails (can be previously frozen), steamed *You can ask your seafood department to steam the tails while you shop for other ingredients! The spiciness of the arugula and the bitter tartness of the balsamic help balance the sweetness of the roasted pears. All in all a perfect flavor combo. 6 pears, sliced in half, stems retained *the less ripe the better! On a foil-lined baking sheet, place pear cut-side up and drizzle with a bit of vegetable oil. Roast for 15 minutes or until browned slightly but still slightly firm. 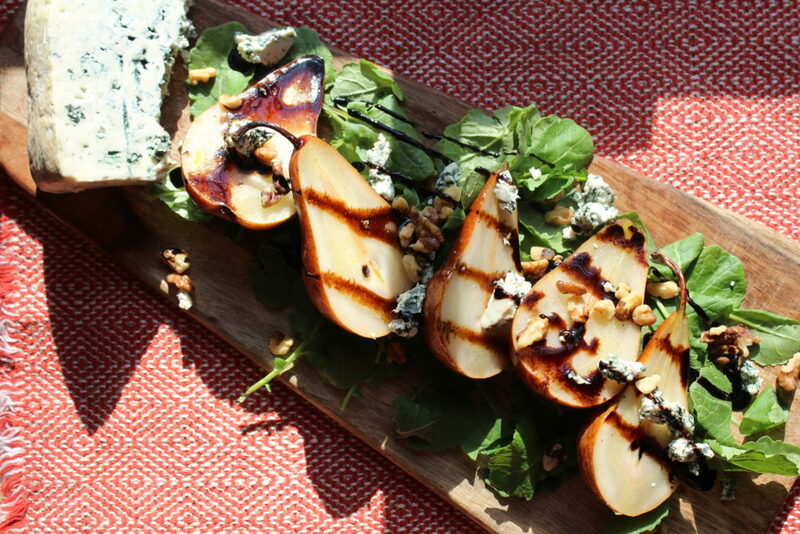 Serve warm pears on a large platter topped with baby kale, shallot, bleu cheese if desired and a drizzle of balsamic syrup + high quality olive oil. *If you don’t use the bleu cheese, go ahead a sprinkle some salt on those pears...you won’t regret it. Pairs well with a variety of cheeses (all of them really - delicate and nutty, strong and firm, pungent, and fresh, salty and sour cheeses). Pairs with fin fish, shellfish, white meat and cured meat. We love Rose around here but sometimes it's important to pair it with a super simple dinner. But fret not, we added a nice helping of lobster to this "fancy" mac & cheese...so feed it to someone you love! It's filled with the good stuff. To cook lobster tails, defrost completely (if frozen) and place in a boiling pot of water. Cook until pink and flesh is firm. Remove cooked lobster from water, cool, remove meat and chop. Set aside. Cook pasta according to package instructions minus 1 minute. Drain and pour into a baking dish. In a large skillet, cook onion with butter and half the olive oil over medium heat. Add the flour or cornstarch after 5 minutes and cook for 2 minutes more. 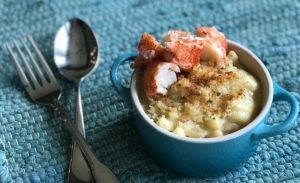 Add milk and lobster stock, little by little at first, making sure to whisk after each addition to prevent lumps and create a smooth sauce. Add cheese and whisk to combine and melt. Add salt, taste and adjust accordingly. Remove from heat and pour into the baking dish over pasta, mixing gently to combine. Add 2/3rd of cooked, chopped lobster and stir gently. In a small bowl, mix panko with the rest of the salt and oil. Sprinkle over top of mac and cheese in baking dish. Scatter the rest of the chopped lobster on top. Place in the oven and bake for 15-20 minutes or until further cooked and bubbling. Use any mushrooms you like to add a huge depth of flavor to this simple, yet delicious, soup. The best part is adding a sprinkling of fresh thyme to the soup before serving. 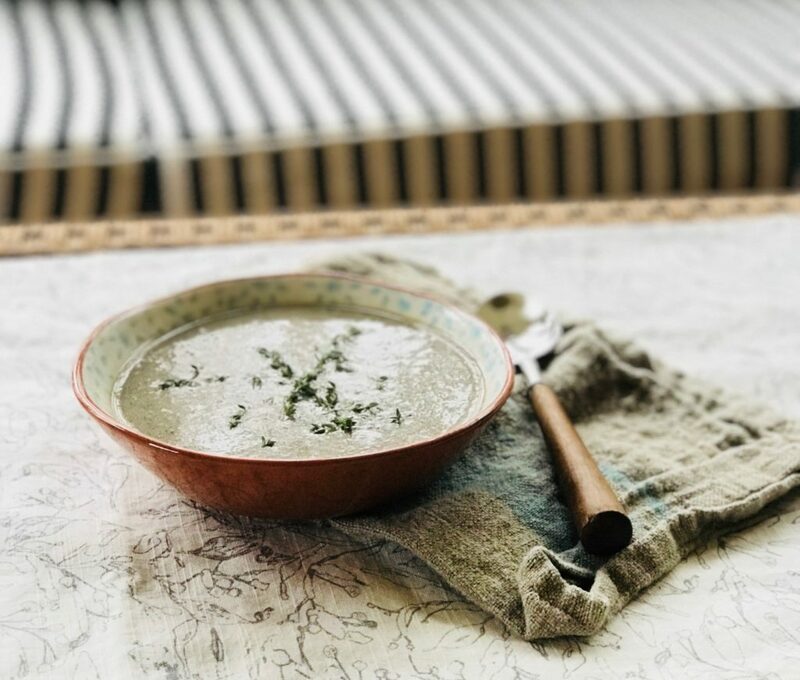 The thyme adds a nice bright bite of flavor and also helps break up the smoothness of the soup, helping to make each spoonful new and adventurous. In a large soup pot, cook olive oil or butter with onions and garlic for 5 minutes, stirring often. Add flour and cook for an additional 2 minutes, stirring often. Add liquid, 1 cup at a time while stirring frequently to create a thickened paste. Add mushrooms, thyme and bring to a boil. Reduce to a simmer and cook for 10-15 minutes, or until mushrooms are cooked through. Turn soup off heat and transfer carefully to a blender. Puree until smooth, return to the soup pot and add salt and pepper to taste, plus milk or cream if using. Reheat if necessary and serve with a sprinkling of fresh thyme leaves and a side of crusty bread if desired. 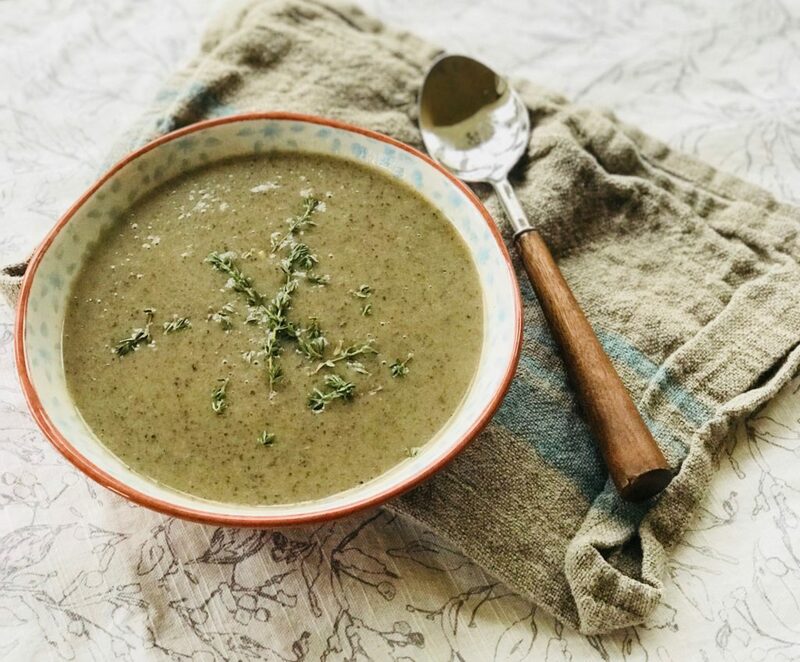 Because this soup's ingredients can be adjusted so easily to suit all dietary needs, make sure to leave out the dairy if Vegan, sub in a gluten free thickening agent instead of flour, and know that leaving out the milk or cream at the end still makes for an incredible final product! 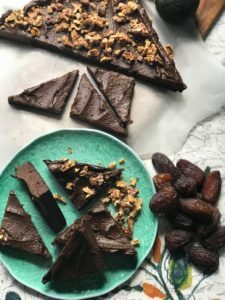 Enjoy this Vegan, No Sugar Added treat! 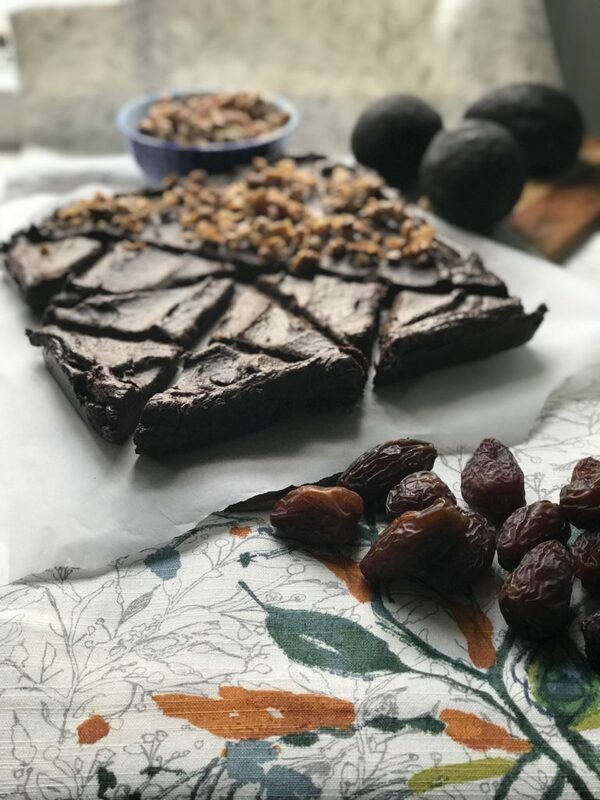 It's filled with protein from the walnuts and fiber from the dates, plus an extra benefit from the unsweetened cocoa powder and avocado, which provides an excellent source of healthy fats. 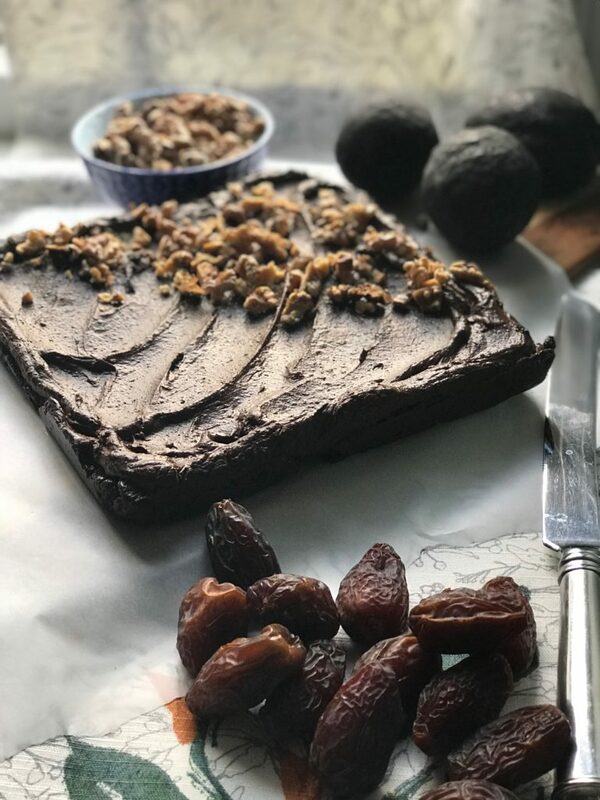 Assuming that the people you serve this to do not have nut allergies, this is a fantastic alternative to normal brownies, and since it is a No Bake recipe, the nutrients are also preserved! 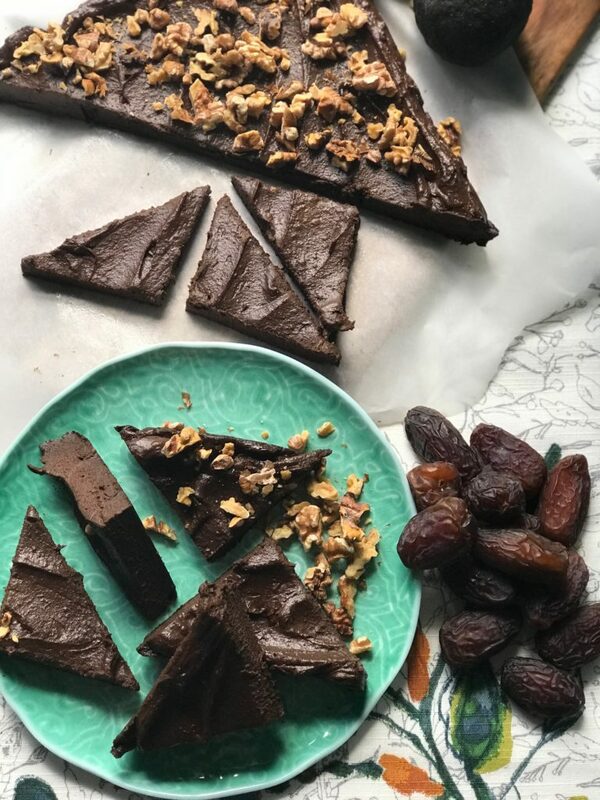 In the bowl of a food processor, combine the raw walnuts, 1 1/2 cups dates (reserve the last 1/2 cup and use as needed to thicken), 3/4 cup of the cocoa powder, and half the salt. Blend until nuts are completely ground and there are no lumps, pulsing as needed to pull down any stragglers. Next, add hot water 1 Tbsp at a time while the machine is on and processing, continuing to add water until you form a thick paste. *Too thin and the base will have too much liquid and not firm up properly so remember you can always add but you can't take away. At this point if you've accidentally made your base too thin, add that 1/2 cup of reserved dates! Pull out two sheets of plastic wrap and spray each on one side with cooking spray. Place one sheet into the bottom of a square brownie pan and press to form into the pan. *If you have trouble with this step, spray some cooking spray under the plastic to help it stick to the pan. Lift up your food processor and place your finger underneath the bowl and into the hole of the blade. This will keep it in place while you spoon out the base mixture. Empty the base mixture into the brownie pan on top of the plastic and place the extra sheet of oiled plastic on top. Press gently to smooth out the base and spread to the corners of the pan. 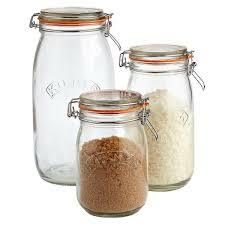 Make sure the base is level and smooth, then remove the top layer of plastic and reserve. Place your scooped avocado, coconut oil, the 1 1/4 cups cocoa powder, the rest of your salt, and 1 cup pitted dates into the processing bowl. Blend until smooth and repeat the process as above, adding hot water little by little until everything comes together and looks smooth and spreadable. At this stage you can add maple syrup for extra shine and sweetness, but that's optional if you'd like to keep added sugars out of this dessert. Spoon out ganache and spread on top of the base mixture. Cover loosely with that oiled piece of palstic wrap you reserved and place in the fridge to chill for at least 2 hours, preferably overnight. 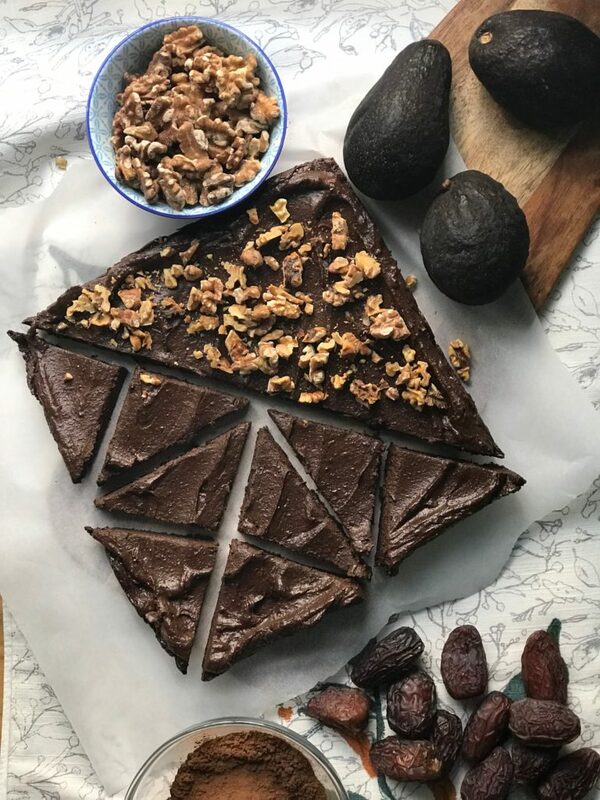 While you're waiting for your brownies to chill (and firm up), toast your walnuts for garnish if desired using this recipe. Te serve, remove top layer of plastic wrap, sprinkle with nuts, and slice into triangles or squares. This can be served at room temperature or still cold, but we recommend enjoying cold since they are easier to handle! 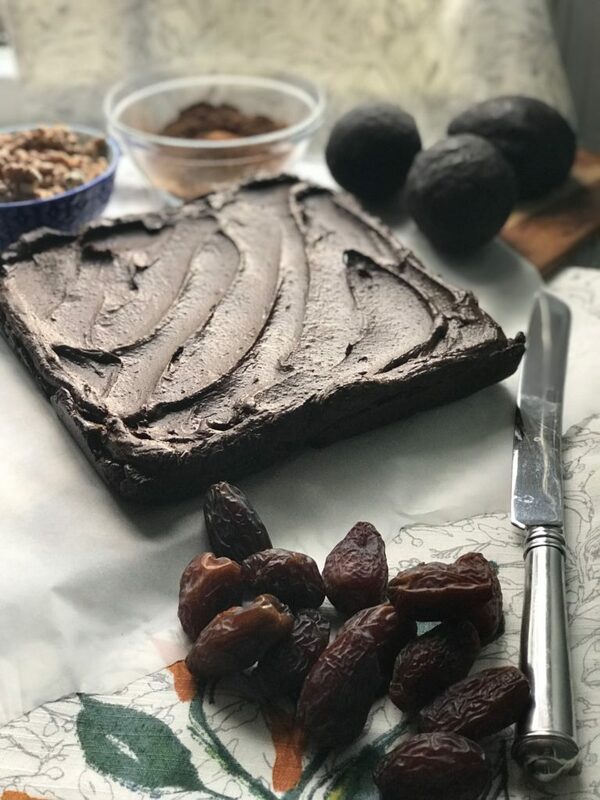 We love the avocado in this recipe especially because since it is mixed with cocoa powder, you won't be able to see that unappetizing brown color as the avocado oxidizes!